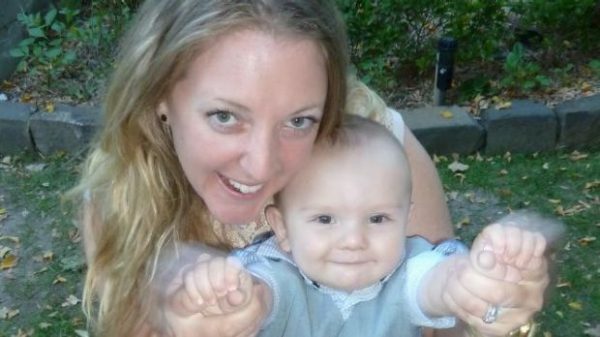 Victorian woman, Sarah Hawthorn, was struck down by the flu in August this year while in the later stages of her pregnancy. Doctors placed her in an induced coma to save her life, and unbeknownst to Sarah, delivered her baby prematurely via an emergency c-section. Amazingly, three months later she’s now woken up and will finally be able to begin her recovery and meet her baby boy. Seven months into her pregnancy, 33-year-old Sarah Hawthorn from Cobram in Victoria contracted the flu. Previously she had been fit and well but sought help from doctors as her health rapidly declined. After initially being turned away from the hospital, she was admitted and diagnosed with influenza A, pneumonia and other complications. Due to the serious nature of her condition she was placed in an induced coma. Given how critical her illness was, doctors performed an emergency c-section and delivered Sarah’s healthy baby boy six weeks early on August 28. Nicknamed “Bomber Hawk,” Sarah’s husband Robert and her family decided that he wouldn’t be named until his mama woke up, and in the meantime set up a fundraising page to help cover costs such as travel and accommodation (given they live 270km away from the hospital), living expenses and her expensive medical bills – which will continue to climb now that she’s in recovery. Miraculously, Sarah has now woken up from her coma although her road to recovery will be long. The Alfred Hospital where Sarah has been the last three months in intensive care released a statement on behalf of her family confirming her condition had improved and she was now awake and stable. “Her son is fit and healthy. We’ve been overwhelmed by the generosity of the community, and all the kind wishes we have received,” her family stated. They also thanked the staff and intensive care unit at The Alfred for their dedication to the new mum. “It has been a big journey for our family and at this stage, while Sarah is in recovery, we won’t be making any further comment. During Sarah’s rehabilitation, we ask that you please continue to respect our privacy,” read the statement. There has been no word yet on whether Sarah has met and named baby “Bomber Hawk”, but thankfully they now have plenty of time to make up for those three months they spent apart while she recovers. The recent flu epidemic has been one of the worst to hit Australia in years, with 215,280 influenza cases and 504 deaths confirmed nationally. The elderly, babies and pregnant women are those most at risk; however the virus has also claimed the lives of healthy, young individuals this year and is a reminder to stay vigilant by seeking medical assistance and taking preventative measures to avoid contracting the virus. If you are expecting, the best prevention against influenza is to get the flu vaccination which is free for pregnant women. Avoiding others who have the flu and getting plenty of rest is also advised. We’re so delighted to hear that Sarah is now awake and wish her all the best for a speedy recovery. To donate funds simply head to their Gofundme page.